In just the last few trading days, International Paper Company (NYSE:IP) has gone from a bullish chart to a bearish chart. Note the chart below and the key double top hit late last week. In addition, last Friday, a beautiful topping tail formed. These are two bearish short term indicators telling pro traders the stock may have weakness in the coming days. 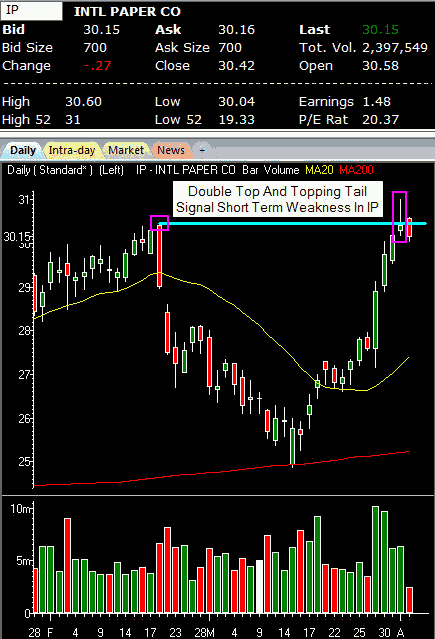 True to form, International Paper is falling slightly today off that level. The stock is trading at $30.16, -0.26 (-0.85%). With the NASDAQ flat on the day, Intel Corporation (NASDAQ:INTC) is showing relative weakness, trading at $19.42, -0.30 (-1.52%). The chips are weak overall as the Semiconductor HOLDRs (ETF) (NYSE:SMH) is also down 1%. The key with Intel is to recognize it took out a pivot short term double bottom at $19.70. This leaves the stock open to fall to its next major support at $18.85. At this level, Intel should see solid support. The fertilizer stocks are showing solid strength today in an otherwise flat market. Stocks like Potash Corp./Saskatchewan (NYSE:POT) and Monsanto Company (NYSE:MON) are trading nicely higher. It appears as if the inflationary fears continue to drive up these stocks. They are quickly approaching a major double top on their daily charts. The Potash double top resistance point will be at $64.00 while the Monsanto double top will be $76.70.